Here’s a synthetic post, dedicated to the talented folks in total synthesis who have a lot of really cool tricks up their sleeves. I am going to talk about just one (or two) steps in Tohru Fukuyama’s fairly recent lyconadine synthesis. 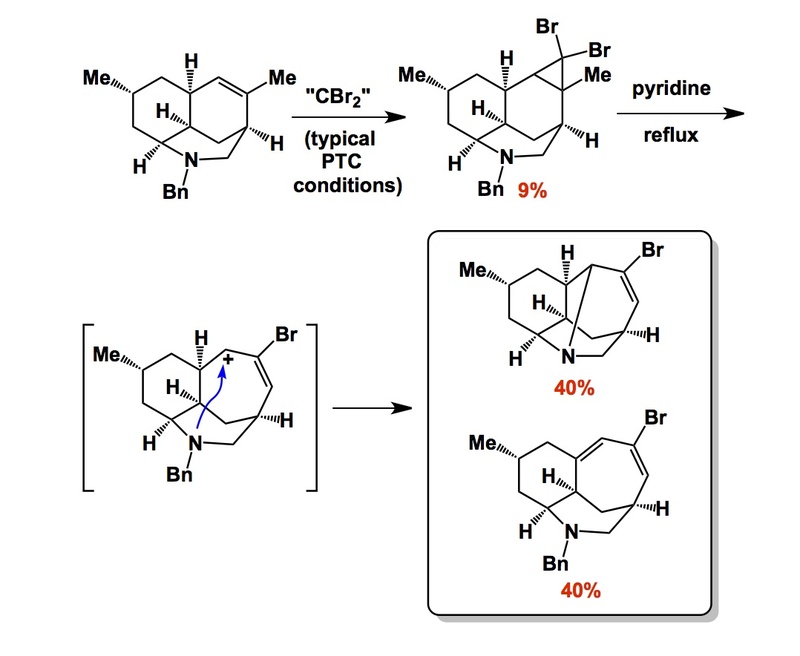 The sequence goes through one of my favorite processes – a microscopic reverse of an electrocyclization… I mentioned a similar reaction in the past when I referred to our own work in electrocyclic ring-opening of bromoaziridines. Take a look at a clever use of electrocyclization (its microscopic reverse, that is) in efforts to create a complex 7-memebred ring. First of all, please note the dibromocyclopropane preparation. Wait – before we go any further: do you know whose process this is? If you are thinking of Prof. Makosza from Poland, you are correct as he is the man! I already commented on his vicarious aromatic substitution mechanism. The phase transfer-catalyzed dibromocyclopropanation hails from his lab as well. The yield here is not great, presumably since we are dealing with a fairly challenging substrate… Then comes the key step, which is carried out in pyridine at reflux. A ton of fun, no doubt, but the result is impressive – the ring system is set up and the benzyl group is gone… There is an elimination pathway that competes, but these are minor details. It is still an elegant sequence. I think one nice lesson here is to always remember the principle of microscopic reversibility, which is not simple when thinking about retrosynthesis, in my view!